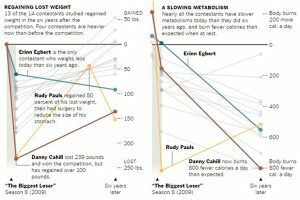 Lessons from NBC's "The Biggest Loser"
In an amazing article in the New York Times past participants from NBC’s “The Biggest Loser” were to see how they had managed to maintain their results from the spectacular weight loss they had achieved during the show. The results were devastating …. more on this later. For those of you not familiar with the show reality show “The Biggest Loser” it was an American competition that ran on NBC for 12 seasons from 2004 – 2016. The show featured overweight contestants who competed to win a cash prize by losing the highest percentage of weight relative to their starting weight. Never mind the optics of this show, which I personally have a lot of problems with, putting the body through such a stressful weight loss program using TRADITIONAL weight loss techniques is not a sustainable approach..
Take Danny Cahill, who won Season 8 of NBC’ reality show. He lost 239 lbs (WOW right?!) in 7 months and was quoted after the show, “I’ve got my life back,” he declared. “I mean, I feel like a million bucks.” Well fast forward since … he has gained 100 lbs since despite his best efforts. MOST of the participants gained it ALL back, some gaining more than they had originally started with. The research project conducted by Dr. Kevin Hill studied the participants up to 6 years after their “successful” weight loss journey on the show. His results showed that the contestants bodies actually FOUGHT against weight loss over time. 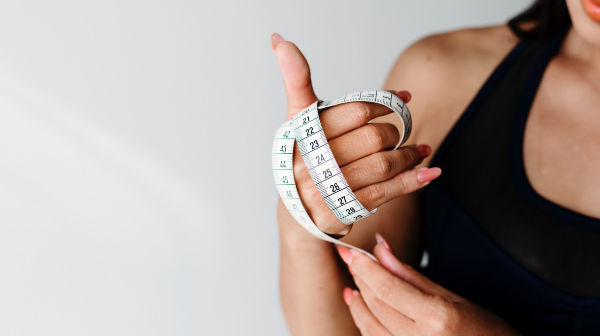 The reason for this, according to the research, was under traditional weight loss (caloric restriction and exercise) the metabolisms of the contestants SLOWED down during the weight loss period and REMAINED lower than a normal person over the LONG term. Rapid Weight Loss simply did not work for these individuals using traditional approaches. However there is another way. Intermittent Fasting, done properly. allows both RAPID and SUSTAINABLE weight loss. 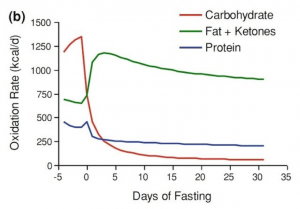 The reason is that during intermittent fasting the body goes into Ketosis. Like an hybrid car the human body has two sources of fuel: Glucose and Ketones (from burning fat). When the body burns fat rapid weight loss is achieved without a slowing of ones metabolisms (see chart on Fasting). The main reason for this is that under Intermittent Fasting muscle mass is maintained over time thus stabilising the metabolic rate during and after the losing phase. For more information on this please check out Getting Starting On Intermittent Fasting and the Secret Benefits of Intermittent Fasting or download the Ultimate Guide to Intermittent Fasting available on the Home Page (just follow the links). Previous: Previous post: Organic or Non-organic on an Intermittent Fasting Program?